One of the things that encouraged me to switch to digital photography in the early days was the simple fact that all my photos were time-stamped. Now I can always sort images into the order in which they were taken – often the easiest way to find something – but I also have a rough chronological record of my life which can sometimes be very useful. If I want to remember when I was last in Paris, for example, I’ll almost certainly go and browse my photos to find out. Usually, the timestamp doesn’t need to be very exact. I always have the camera set to GMT, wherever I am – changing timezones is too much trouble – but a few minutes of clock drift is not important. Recently, however, I’ve been geotagging my photos – a big post coming about that sometime soon – and precise timing can then be much more useful. 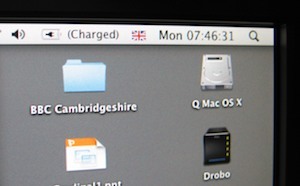 So if I’m about to upload photos from a camera on which I haven’t recently set the time, I’ll sometimes take a photo of the clock on my screen. This is synchronised with Apple’s NTP servers and so is one of the most accurate clocks in the house, and will be nicely in sync with the timestamps on my GPS receiver. Once the batch of photos is uploaded, I can use the difference between the camera’s timestamp and the time shown in the image to fix the timestamps on all the photos in the batch. What’s more, once I’ve done the batch adjustment, I can refer back to the new timestamp on this image to make sure that it matches what’s on the screen and so confirm that I didn’t make a mistake. Regularly setting the time on the camera is even better, but this is a fix for when you take the photos before remembering it!